Yes, but can he survive in the daylight? BallinEurope yesterday read the latest anti-Laker screed basketball column by ESPN.com’s Bill Simmons, an alternately funny and blood-boiling confession-style bit about conditioning one’s children to cheer for the “right” sports team, i.e. Daddy’s favorite team. Ultimately, however, The Sports Guy’s affectionate look at dominating your child’s formative years is perhaps best characterized as “disturbing.” And BiE’s only saying this because he’s a huge Lakers fan and the Boston Celtics can burn in hell of his profound belief in children’s self-determination. After Simmons’ 5½-old daughter Zoë demonstrates an excellent liking for the color purple (good girl! ), the ‘Guy decides to do what any unscrupulous and absolutely typical die-hard Boston Celtics fan would: Namely, he informs the wee lass that Kobe Bryant is an abusive father, that Phil Jackson’s love of dogs is matched only by Michael Vick’s, that Ron Artest wants to punch him in the face (this one might be true, actually), and that Pau Gasol is a vampire. 2) I need a column idea for BallinEurope. The contest will take place over ten metrics measuring general awesomeness, pop cultural power and the all-important potential physic hold over impressionable young daughters. Yes, but does he have hops? Name. Whether you’re a badass supernatural force, a superstud professional athlete, or teen heartthrob packing a killing moniker lends extra cachet. Seriously, would there even be a “Russell vs. Wilt” debate if Mr. and Mrs. Russell had chosen something like “Julius” or “Shaquille” as their son’s name rather than “William Felton”? No. Here, Edward Cullen is “blessed” with a name fit for a childhood movie star gone awry; even worse, the sucker would have won this category going away had he not changed to “Cullen” from the former New York Knick-referencing “Edward Anthony Masen.” Against the rounded cadence of “Pau Gasol” – not to mention the mysterious missing L; chicks dig mystery – Cullen has no chance. Edge: Gasol. Team. Pau of course consorts with the two-time defending champion Lakers, who, until hitting a recent skid, was universally praised for its newfound depth. And for those brief stretches when Andrew Bynum is healthy, Gasol’s team may have the best first six in the NBA. When not a romantic loner, Cullen mostly sticks with his family. All well and good, but that team’s not exactly going to win any supernatural titles against the likes of the werewolf pack, the Denali coven, the Egyptian coven, the Irish coven, the Volturi, and BiE’s personal favorite, the Amazonian coven. Edge: Gasol. Recent Run. How recent are we talking? In the past week or so, the Lakers have shed the aura of invincibility among short attention-spanned observers – no respect for a two-time champ, eh? On the other hand, said back-to-back titles surely inspired off-season moves by at least the Boston Celtics, San Antonio Spurs and Dallas Mavericks, some of which may influence the NBA for a good five years to come. On the other other hand, the Twilight machine is influencing all of American and British pop culture right now, affecting potentially dozens of franchises for god knows how long. Edge: Cullen. Country of origin. Transylvania vs. Spain? 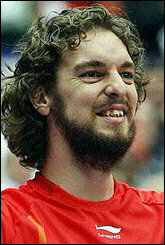 Well, BiE can’t recall the last time Transylvania placed in Eurobasket… Edge: Gasol. Siblings. Cullen’s brothers and sisters (though, admittedly, many among them adopted) include the superstrong Rosalie and Emmett, the empathic Jasper and the future-telling Alice – and yeah, they’re all gorgeous and immortal, too. Pau has Marc, whose stats are a bit down in 2010-11 to 11.7 points, 7.6 rebounds and 2.4 stocks (steals+blocks, courtesy Simmons’ “Book of Basketball”). Gasol the younger has also been praised by Phil Jackson for being more physical that Pau, but, hey, the truth is Marc is with the Memphis Grizzlies, a deader-end bunch than a James-less coven. Edge: Cullen. Superpowers. Cullen: super-strength, -speed, -endurance, and -agility; mind-reading telepathy; immortality. Gasol: great range; best European skill set since Dirk Nowitzki; awesome back-to-the-basket and post games; well above-average defender; superhuman ability to defer in alpha dog role to Bryant; teflon-like skin protects from Jacksonian barbs. Edge: Even. Antagonist. So often is a hero defined by his polar opposite: think Batman and the Joker, Sherlock Holmes and Professor Moriarty, Captain Kirk and Khaaaaaaaaaaaaaaaaaaaaan. Both Cullen and Gasol have inherited their enemies: the former in factions who disagree with the Cullen Family’s “vegetarian” diet, while the latter arrived just in time for the resurrected Lakers-Celtics rivalry. While the vegetarian/carnivore battle goes back to Genesis 4:2 (look it up), the Lakers vs. Celtics war began in the NBA’s first decade and has been a nearly continuous storyline since while creating two of America’s most universally loved sports franchises. Edge: Even. Popularity. Gasol got up to a stunning no. 4 in jersey sales in Europe last season and his gear surely sells well in the huge L.A. market. But geez, *Twilight*? Stephenie Meyer’s is the sort of franchise that would make any Simmons wannabe hack (and any writer this side of Stephen King and J.K. Rowling, really) Celtic green with envy: the books have sold over 100 million copies sold in 40 languages; comprised the entire top four in USA Today’s best-sellers list for 2008; won the 2008 British Book Award, the 2009 Kids’ Choice Award and an MTV Movie Awards best film nod. They may love you in L.A., Pau, but until those free-throw time chants of “M-V-P!” are directed toward you rather than you-know-who, this one’s not even close. Edge: Cullen. Physical Appearance. Have you seen Robert Pattinson? Good. Now check out the picture at left. BiE’s glad we’re all in agreement here. Edge (huge edge among the girlie set): Cullen. #1 Euroleague Play of All-Time? Come on! (Pargo was mighty sweet on that jam, though)Iverson on Besiktas collapse vs Asvel: "We let it get away from us"
Here’s an idea- the Euroleague!! Official BallinEurope Euroleague Power Rankings will be posted first thing tomorrow, my friend! Well, okay, maybe second thing. But they’re coming!